On Friday, the Indian Supreme Court will examine an appeal filed by the Italian marines, Massimiliano Latorre and Salvatore Girone, accused of killing two Indian fishermen off the coast of the south Indian state of Kerala in February 2012. Earlier this month, the two Italian marines filed a petition to prevent the Indian authorities from permitting that country's National Investigative Agency (NIA) anti-terrorism police to probe the case. 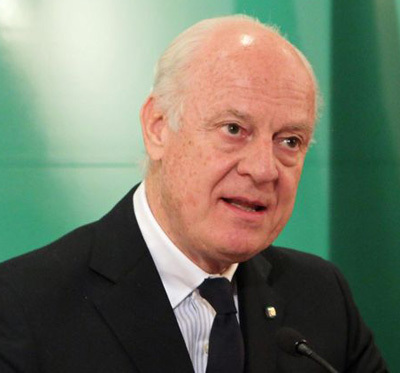 De Mistura has argued that if the marines must face trial, it should be in Italy. "They must come home," he said. He said the pair have been stuck "for too long" in New Delhi and has given them his personal guarantee to see them returned to Italy. The court is also expected to review the marines' request to return to Italy to await the beginning of the trial. The 50-page document argues that allowing the NIA to probe the case is not valid because its jurisdiction only extends to certain laws, such as suppression of piracy, which do not apply to the Italian marines. The document was prepared by the Italian legal team that has worked with the two marines for almost two years. India's Attorney General G. E. Vahanvati has already told the Supreme Court in New Delhi that he favoured dropping the anti-terrorism laws in this case, but has still asked the courts to uphold the NIA leading the investigation. The two marines have been living and working at the Italian embassy in India pending charges. Rome has protested a long series of delays in the case, which has caused a deep diplomatic schism between the countries. Italy is seeking international arbitration on the incident, which it insists took place in international waters.